Are you “stuck” at a certain half or full marathon time and wondering what you can do differently with your training so you can make improvements? I’m often approached by runners with this request. They are following a 16 -20 week plan and putting in miles each week, however the results don’t meet their expectations. A common root cause is that their plan doesn’t have sufficient recovery between difficult workouts. Eventually (much sooner if you are older (40+) runner) they don’t get the full benefit of the training that they desire. 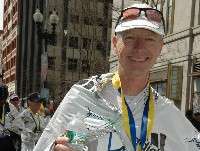 In this post, I will offer a solution that has proved successful for one of the world’s best marathoners. Olympic marathoner Meb Keflezighi switched a few years ago from a weekly to nine day training cycle, also called a microcycle. He realized that he needed more recovery between hard and long workouts. I was intrigued by the concept, so I did some research to find out more. What I discovered is that extending the training cycle from 7 days to 9, 10 or 14 days is not new. The main benefit of rethinking how to train is primarily to enhance recovery. The typical seven day cycle is how we’ve always trained, but it really doesn’t have any meaning to the human body. What we really want to do is apply a stress or hard workout and then allow the body to recuperate. To get the best results, we need to incorporate both the workout and recovery to ensure adaptation. A 9 day cycle works because we can actually incorporate 3 micro-cycles of 3 days each into the cycle. On day 1 we can complete a hard/stress workout like a long run. Days 2-3 would be recovery runs at an easy pace with cross-fit and conditioning or plyometrics on at least one of these days. We would then complete 2 additional micro-cycles in the same manner. The other hard workouts would include tempo and some kind of intervals (doesn’t have to be on the track). 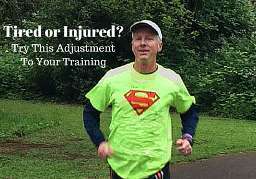 I recommend scheduling and completing a tune -up race, like a 10k or 1/2 marathon during one of your cycles. Not only does a slightly longer training cycle make sense for older and injury prone runners, but it can be particularly beneficial for busy professionals that don’t always have the time to fit in the challenging workout necessary for a half or full marathon. The longer training schedule allows us to keep the same workouts such as track, tempo and a long run, that are all part of a typical seven day cycle, but now we can spread these workouts out more. The end result is that the runner will be recovered and ready for higher quality training. One of the challenges with extending your training cycles is being able to complete your long run on the weekends while still giving yourself recovery time. For those not limited to running long on weekends because they have some flexibility in their schedules, a mid-week long run as called out in the extended cycle may be perfect. Another option to nine day cycles is two week or month long blocks. The same approach would be to plan for specific key workouts within the period and then take however many easy days necessary. A two week cycle may be easier to fit in the typical weekend long runs that many complete with a group. One rule of training with extended cycles is that you’re not allowed to cram missed workouts at the end of the cycle. You’ll have to incorporate these missed sessions into your next cycle of training. Also, it’s essential that your rest days and easy days remain in place. Unlike most 7 day schedules which typically have Tuesday track and Thursday tempo runs and don’t allow much room for a missed workout which could result in 2 hard workouts back-to-back, the 9 day program allows for sufficient rest between stress workouts. Another challenge is simply adjusting your schedule. Give yourself time to adjust and allow your body to adapt. Make sure you try a couple of nine or 10 day cycles before you decide to switch back. A few of the runners that I coach have agreed to try a day schedule over the course of this Summer as they train for a Fall Marathon. I am currently using something similar to the following schedule as I train for the upcoming Vancouver Half Marathon. If all goes well, I will use this type of schedule as I complete my marathon training for Portland. All runners must find a schedule that works best for their needs and abilities. This may mean you need to extend your schedule. The good news is that doing so can help you avoid injury and help you achieve your goals.